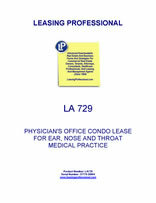 This Lease (“Lease”) is made as of _________________, by and between COMMERCIAL MEDICAL PROPERTY LANDLORD, INC., a __________________ corporation (“Landlord”), and _________________EAR, NOSE AND THROAT ASSOCIATES, a _________________ corporation (“Tenant”). 1. Premises. Landlord does hereby rent and lease to Tenant and Tenant does hereby rent and lease from Landlord for the practice of Medicine and Related Practices the following described space (hereinafter called the “Premises” or the “Unit”): ___________ square feet of office space more particularly described on Exhibit "A" attached hereto and made a part hereof by reference. The Premises consists of a portion of the Building in the _____________ Condominium ("Condominium"), which has been created by a declaration ("Declaration") recorded at _________________ in the Records of _________ County, ________. Capitalized terms not specifically defined in the Lease have the meanings ascribed to them in the Declaration. The Unit is described in the Declaration and Condominium Plat, which is attached to the Lease as Exhibit A. Tenant acknowledges that the Premises are located in the Condominium and therefore the use of the Unit by Tenant, subtenants, employees, agents, guests, invitees and licensees of Tenant, is subject to the covenants and obligations of the Condominium Rules and Regulations and to the provisions of the Declaration, which are in addition to the covenants and obligations contained in the Lease. By executing the Lease, Tenant acknowledges receipt of the Declaration and agrees to be bound by the covenants and obligations required thereby and by the terms and conditions contained here. 2. Lease Term. Tenant shall have and hold the Premises for a term beginning as of _______________ (the "Commencement Date"), and continuing for a period of _______________________ months thereafter. (b) Notwithstanding anything to the contrary contained herein, the rent for the first month during the term of this Lease shall be paid at the time of execution of this Agreement. No part of any monthly rental payment made under this Lease shall be returned to Tenant regardless of whether Tenant vacates the Premises voluntarily or vacates the Premises at the insistence of Landlord. 4. Partial Payment. No payment by Tenant or acceptance by Landlord of any amount less than the monthly rent herein stipulated shall be deemed a waiver of any other rent due. No partial payment or endorsement on any check or any letter accompanying such payment of rent shall be deemed an accord and satisfaction, but Landlord may accept such payment without prejudice to Landlord's right to collect the balance of any rental due under the terms of this Lease. 5. Construction of this Agreement. No failure or Landlord to exercise any power given Landlord hereunder, or to insist upon strict compliance by Tenant with its obligation hereunder, and no custom or practice of the parties at variance with the terms hereof shall constitute a waiver of Landlord's right to demand exact compliance with the terms hereof. Time is of the essence of this Agreement. 6. Use of Premises. Tenant shall use and occupy the Premises for the professional services set forth in Paragraph 1 hereof and for no other purpose and such practice shall be performed in strict compliance with the Code of Ethics of such profession. The Premises shall not be used for any illegal purpose, nor in violation of any valid regulation of any governmental body, nor in any manner to create any nuisance or trespass, nor in any manner to vitiate the insurance or increase the rate of insurance on the Premises. If Tenant or any physicians or other professionals practicing with Tenant have their license revoked, or if Tenant or any physicians or professionals practicing with Tenant are convicted in any court of any criminal offense, Landlord shall have the option of terminating this Lease. 7. Definitions. "Landlord" as used in this Lease, shall include first party, its representatives, assigns and successors in title to premises. "Tenant" shall include second party, his heirs and representatives, and if this Lease shall be validly assigned or sublet, shall also include Tenant's assignees or sublessees, as to so much or all of premises covered by such assignment or sublease. "Landlord" and "Tenant" include male and female, singular and plural, corporation (and if a corporation, its officers, employees, agents or attorneys-in-fact), partnership or individual, as may fit the particular parties. "Building" shall include the office building in which the Premises are located, all improvements thereon and any parking facilities appurtenant thereto. "Rental" or "rent" shall include Base Rental, Tenant's proportionate share of Operating Expenses (as hereinafter defined) and any other charges or amounts payable to Landlord hereunder. 8. Repairs by Landlord. Tenant, by taking possession of the Premises, shall accept and shall be held to have accepted the Premises as suitable for the use intended by this Lease. Landlord shall not be required, after possession of the Premises has been delivered to Tenant, to make any repairs or improvements to the Premises, except repairs necessary for safety and tenantability (including exterior walls and structural repairs). Tenant shall report at once in writing to Landlord any defective condition known to it which the Landlord is required to repair, and the failure to so report shall make the Tenant responsible for the damages resulting from such defective condition. 9. Repairs by Tenant. Tenant shall, at its own expense, keep and maintain the Premises, appurtenances thereto and every part thereof in good order and repair, provided, however, that Tenant shall have no responsibility to repair or maintain any portion of the Premises for which Landlord shall be responsible for repairing and maintaining as provided in Paragraph 8 above. Tenant shall in all events promptly make at its own expense such repairs as shall be required by reason of the negligent acts or omissions of Tenant, its agents, contractors, employees and invitees, or by reason of the misuse of the Premises or any portion of the Building by Tenant, its agents, contractors, employees and invitees. Tenant shall make no alterations in, or additions to, the Premises Without first obtaining Landlord's prior written consent for such alterations or additions, which shall be at the sole cost of Tenant. Landlord agrees to assign to Tenant any rights it may have against the contractor of the Premises with respect to any work performed by said contractor in connection with improvements made by Landlord at the request of Tenant.